Introducing the Atmosphere Sky Air Treatment System. Winter is quickly approaching and I know my family and I will be spending a lot more time indoors. On any given day, during the cold months, you’ll find us curled around the fire or watching a family movie together. With that in mind, it gets me thinking about the air quality and comfort of our home. One of the things that I strive to do is make our home more comfortable, not only during the winter but year round. Most importantly, I think about the air we breathe indoors. Did you know that the air inside our homes can be 5 times more polluted than the air outside? Read on to see how you can make your home more comfortable and what can help you purify the air you breathe! Being Latina, I remember every Saturday morning waking up to my mom’s cumbias, bachatas and merengues – that meant it was time to clean! While I am a firm believer in cleaning as I go, what home doesn’t need a good deep clean before the fall and winter months? I put on the Latin beats and get the whole family involved, and I won’t lie, I also get the maid sailors apartment cleaning services involved. Once we are all hyped, we do the cleaning together. Dusting, sweeping, mopping, and steam cleaning helps us to prepare for those long winter days – especially since we’ll be spending more time indoors. After you’ve done a deep clean, make sure you keep it up every week. That way, you don’t give dust or dirt a chance to accumulate. If you have pets like we do, pet hair and dander can build up quickly, so make sure you clean often. You’ll find that it gets so much easier when you adopt this habit. Plus, these are great chores to get your kids to help you with! Having an air purifier can be life-changing for you and your family’s home. 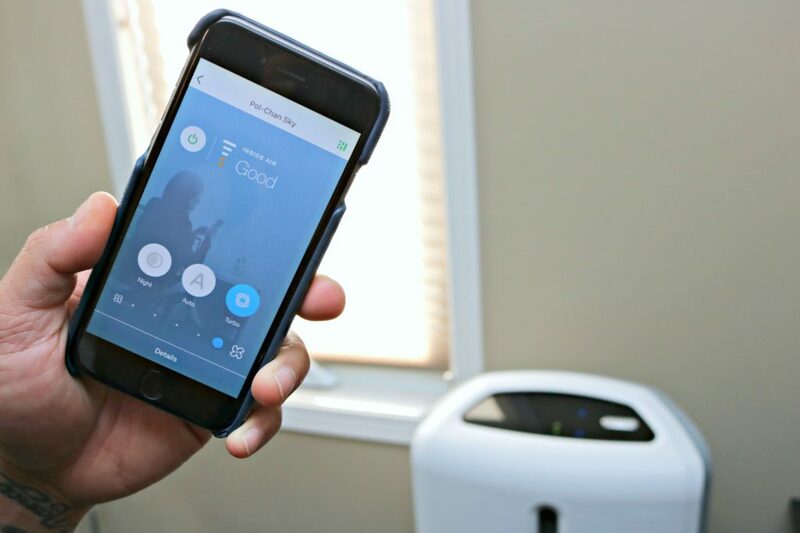 Since I’m focused on making my home as comfortable as possible, I have found that our Atmosphere Sky Treatment System does just that. It helps remove impurities that would otherwise still be in the air. One of the best things about making this investment is that you have up to 5 years of warranty. You get a 2-year warranty and up to 3 years of renewable warranty protection when you change your filters on time. Keep reading to find out how the Atmosphere Sky is an excellent choice for making your home more comfortable. Have you always wanted to make your home’s air more pure, but weren’t sure where to start? It is truly shocking how many impurities are floating around our homes – dander from pets, debris from plants that float in from outside and dust. I just named 3 of the many disturbances that are floating in the air around your home. Believe me, there are much more. You may be wondering if there is a way to alleviate these disturbances and make your family’s breathing that much easier. Check out this easy guide to understanding how the Atmosphere Sky Treatment System can help your family – because there’s only so much that Vicvaporu can fix! 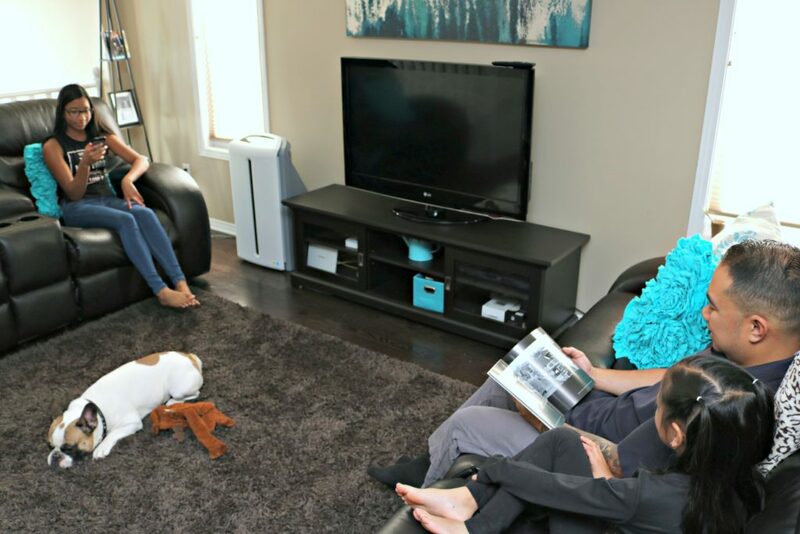 Most of us just want our families to breathe easier, which is why the Atmosphere Sky makes sense to add to any home. It filters up to 468 sq. feet of space and helps to improve indoor air quality with the help of its 3-stage purification system. During the pre-filter, it captures large airborne fibers and hair that are floating around your home. It then moves onto utilizing the HEPA Filter. The HEPA Filter helps to take the air purification a step further by removing small particles from the air (think bacteria, mold, fungi and more). The last step of filtration is when the Sky unit utilizes its carbon filter to help remove toxins from the air, such as dioxin and even odours from cooking, pets and smoking. The HEPA filter has an estimated lifespan of 1-3 years and the carbon filter lasts an estimated 4-12 months. Something neat about the Atmosphere Sky is that it continuously monitors the room’s air quality (when the unit is on). You can trust that it will do its job to remove any impurities from the air as it senses them. The engineers of this product have even created it to have an optimized air path so the air flows through in the most efficient manner. The cool thing about the Atmosphere Sky is that it can be utilized by an app. You can turn the unit on or off remotely, plus check the air quality, device status and filter life. Now if that doesn’t scream modern technology, I don’t know what does. 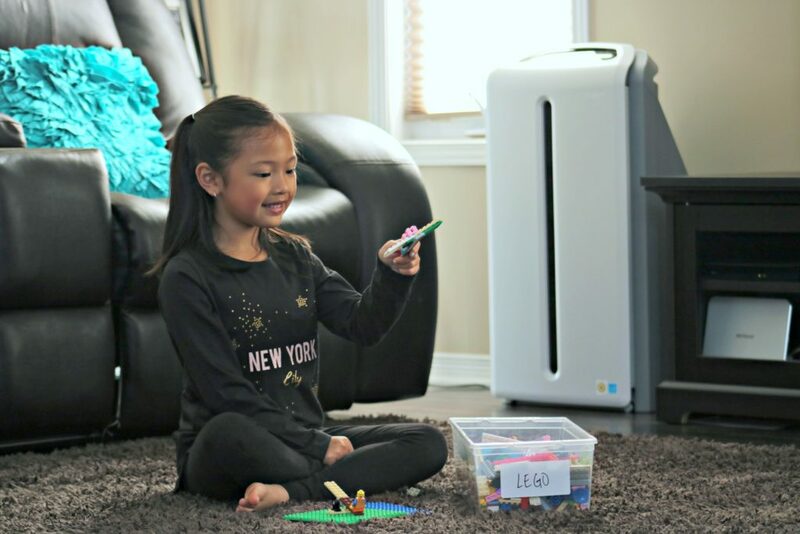 Overall, the Atmosphere Sky Air Treatment System is the BEST-PERFORMING HEPA air purifier among top competitors for removing allergens and other contaminants. In fact, it removes more than 130 contaminants (such as viruses, allergens, bacteria, mold, and mildew). from the air that passes through the unit. Now that you know how you can make your home more comfortable, it’s time to make the changes. You may already be doing the majority of these and all you have left to do is spot clean and invest in a quality air purifier that can help your family breathe better air. Stay tuned for our full experience with the Atmosphere Sky soon. We’ll let you know how it’s become an integral part of our home. For more information about the Atmosphere Sky Air Treatment System, be sure to visit their site. 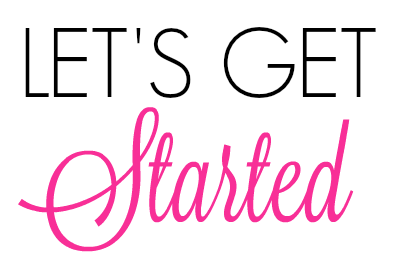 Get social and follow them on Facebook, Twitter, and Instagram for the latest updates as well. How do you make your home comfortable? Note: This post is sponsored by Amway. All thoughts and opinions are honest and my own. We have forced hot air heat, so our house get DUSTY. A good air purifier is a must and we have to deep clean often. It would definitely help to do all of the above! Using home equipment with HEPA filters helps make our home more comfortable and changing air filters every 2-3 months helps also. 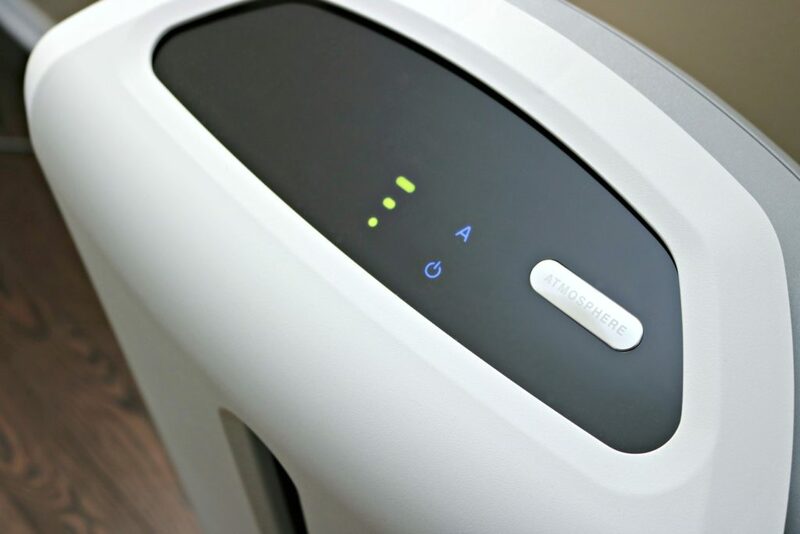 We have a lot of traffic in and out of our home which means more allergens creep in and out of our home so it’s important to maximize air quality and our air purifier does a great job of doing such. What I love about this system is that it will let you know when you need to change them! This looks so perfect for my family. We live in Georgia, and it’s allergen capitol! Even though we keep our home clean, this would help filter out all the allergens that hitch rides into the house on our clothing. Oh, it would definitely help catch those! WOW! I need that in my home! I think the technology in it is absolutely fascinating. Every home should have one of these purifiers! Never really thought about purchasing a clean air machine, we usually just open up the windows. Does it take up a ton of room? Nope, it is just right. I would normally open the windows too but, it lets in allergens. This looks like a powerful air machine. I need this for all my allergies. It would definitely help alleviate them. I live in Arizona where dust lives as well. This would be great here. This is an amazing way to make sure that your air is clean and healthy! These are all really great tips. The Atmosphere sky looks as though it would be very beneficial to your family. My husband is big on clean air in the house, so I’ll have to get this for him. I mean, I’m big on it too, but he’s more obsessive than I am. This will make for a great Christmas gift! Hehe, I tend to be the one obsessed! So I completely understand. I actually think we need one of these. Our house is incredibly dusty because our backyard right now is all dirt and her dog keeps bringing it inside. I will definitely check this out. You will definitely love this. The Atmosphere Sky would be a great thing to have in our house, especially with having 2 dogs. I love that it syncs with your smartphone. Loving that this has an app! I desperately need to get the Atmosphere Sky! Clean air is no joke and is vital for our health! Thanks for writing about this – going to check it out now! My pleasure, clean air is so important! I’ve always been curious about air treatment systems. I will definitely be looking into getting the Atmosphere Sky. It sounds fantastic! It is a great system! We got an air purifier to help improve the air quality in our home. Both of my kids have asthma and the purifier has really helped out a lot, especially during pollen season. We used one of these when we lived in China because the pollution is so bad there and insulation in the city apartments was horrid. These little machines are great! They can really make a difference. Then it is definitely worth looking into! And thanks, it is one of my fave colours. Really think we should invest in a air purifier since hubby has really bad allergies. Will have to check this one out. So cool that it has an app to make it easier to keep up with. Air quality is very important and this system seems like it would help tremendously. It is always nice to know what the quality is at any given time. I like the look of it and that it is so effective is wonderful. I love all your tips! We have two dogs o we can definitely use all the help we can get! The Atmosphere Sky sounds incredible and like it should be a must have feature in every home if you want the best air quality! I completely agree and glad the tips can help! I’ve thought about using an air treatment system to help with our seasonal allergies. I’m sure a lot of stuff collects in the vents over the years. Yes, and day to day too! We can definitely tell when it’s getting too dusty in our rooms with wooden floors. Little cat hairs start floating around and bothering us when we run the fan! The Atmosphere Sky sounds awesome. I’m loving the smart features! So cool to be able to use it through an app. These are all really great tips. I suffer from severe allergies to just about everything outdoors so we have to be super careful with the inside. I really should get a unit like this. Yes, looking into it would be beneficial! I would love to have one of these units for my home too. They are really sleek and I bet effective! I could so use one of those. One of my daughter’s has asthma and allergies and I mean, everyone can benefit from cleaner air right? I love the sleek look, it fits right into your home without standing out. Yes, we can all benefit for sure! I could so use something like that during allergy season. This year was particularly bad – need to prepare for next year! It is still bad for me! Sinus pressure. 🙁 Definitely check it out! We have pets so I have wondered if we needed to purify our air. I will have to take your advice and check this out! It is for us, hope it helps you! This sounds like a really great unit. Being able to so easily improve your indoor air quality would be awesome, especially for homes with allergy-sufferers. So cool! I bet this would be so nice to have with kids and pets in the house. I’ll have to check out this air purifier! Oh, I love this! We all find ourselves with so many allergies, this would be great for our home. Thank you, I’ll be checking this out for sure! Awesome!! Yes, we have a home full of allergy sufferers. I have been considering getting an air filtration system. I am totally going to check this one out, thanks for sharing! My pleasure! Hope you like it. The Atmosphere Sky Air Treatment system looks like a very neat gadget. It’s especially advisable for those who are often affected by allergies and respiratory problems. 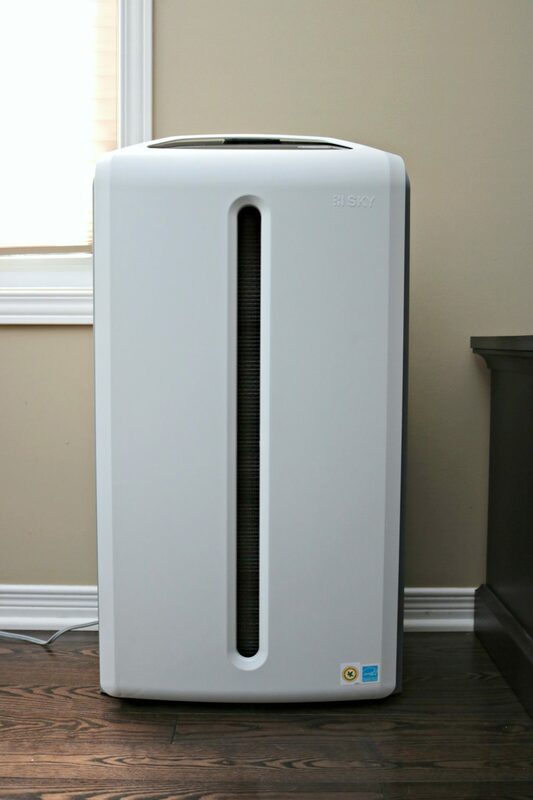 As bad as my allergies are (year round) I need to check out one of these air purifiers! Thanks for the heads up on this one! Girl, you and me both are bad year-round. This will definitely help! I have never heard of the Atmosphere Sky and will definitely look into it when I am due for a new one. I have air purifiers in every room, I live in an apartment complex and let’s just say the smell of my inconsiderate, noisy, rotten, and lousy neighbor’s vices fill up my apartment, and since I do not smoke any kind of cigarette I hate that nasty smell coming into my home and have been using air purifiers for years. That’s also the first thing I do when I check into a hotel, even five star ones, I ask to use an air purifier, and leave it running while I am out the room so when I return the air is less stale and feels fresher. It is NEW! But, yes, it is a cut above the rest! Hope it can help you out with the smoking situation! My son has allergies and asthma so this would be a lifesaver literally for him. I’m really going to look into this. Awesome! Hope it can help him. Okay, I may need one of these… I have a new baby on the way and I just keep thinking I need to get a good air purifyer. My house is dusty and old, so it gets dusty easy. That would help! Totally will and what better reason to get one than for your little one? We are huge advocates for air filters/purifiers. I have never heard of this brand, but I plan to look into it. I highly recommend an air purifier/filter for every home. We are so much less dependent on allergy medicine since we discovered them. Wow this is really intriguing to me. I always feel like the air quality is so stale in my home. I would love to try this out. Then you definitely have to check this out! We do a deep clean a few times a year and definitely spot clean whenever we can. This looks like it would be great for the air quality! Yes, deep cleaning helps and the Atmosphere Sky helps to catch what you don’t or cannot! I love how slim it is and the fact that it doesn’t take up much room. Yes, it fits in perfectly! Thanks for the introduction sure sounds like a wonderful system! My pleasure, I will be sharing about it next week! Now that’s a gadget I would love to have. I love my house being fresh! Me too, it makes a world of difference. A lot of people dont realize how dirty indoor air really is. This sounds like such a great solution. I would love to check out this product for myself. Yes, it is pretty surprising how dirty it really is. The winter is rough for my little ones. Having the Atmosphere Sky would certainly make them happier and healthier. Yes, it would be perfect for them! This looks like something we could really use. We all have bad allergies and this would really help. My husband and my son would benefit greatly from this machine. They are both sensitive to dust and pollen and it is a must for me to keep the house free from these allergens. I will take a closer look at this Atmosphere Sky. Thank you for the honest review. I have to check out the Atmosphere Sky. It looks like a great system! I have forced hot air heat and I could definitely use this. It’s funny that I’m seeing this right now because my sweetie and I were just talking about getting an air purifier. The Air Treatment System sounds like a real heavy duty piece of equipment. I like that it removes smoke and cooking odors…would especially come in handy when you’ve burnt food by accident. Yes, it has helped us for those smelly dinners! Most members of my family suffer from allergies so this sounds perfect. I love the sleek look and how well it fits into your room. Yes, those are a couple of my favourite things too. It will definitely make your air more comfortable. Being a pet owner wants me to have one of these in the house! Does it include a humidifier on top? That is one of the reasons why! I have asthma and allergies so this might be just what I need. I will have to check it out. Hope it helps your home! I have a daughter with Asthma, so I know this would help as well as the rest of our family breath better. For sure, it is something to look into for sure. My children are so sensitive to things in their environment, I think an air purifier would be amazing! The Atmosphere Sky looks so chic, I am adding this to my Christmas wish list! Awesome, hope it helps your home! Great post thanks for sharing,you have a beautiful family Nancy right down to the sweet dog! I think we need a system like this in our home. We are due for a good deep cleaning. We have been remodeling our kitchen so the house is kind of in disarray. I would like to get it done before Winter, hopefully we will be done in time. Right now I have cabinets, boxes and appliance for the kitchen in my living room. It’ll be so worth it when you’re complete!